Scott Dixon started the day third in the 2015 IndyCar standings. He ended the day as not only the race winner at Sonoma, but also as the season champion. 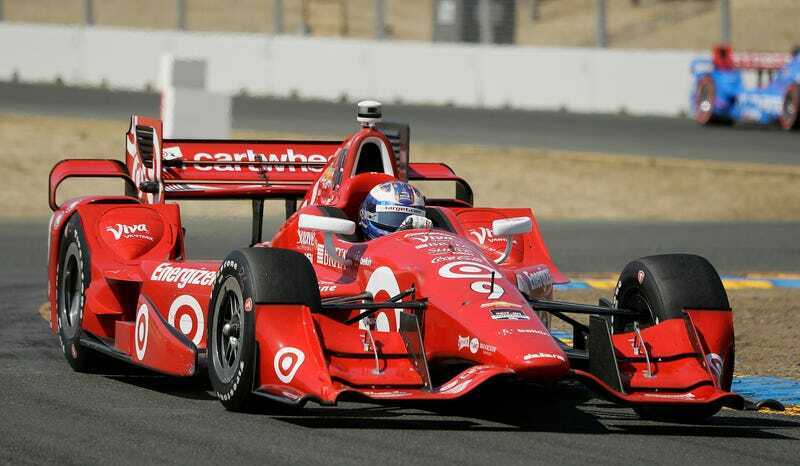 The Chip Ganassi Racing driver can add a fourth IndyCar championship trophy to his case, beating out points leader Juan Pablo Montoya as well as pole sitter Will Power and rising star Graham Rahal to take home the victory. Dixon came into the race 47 points down from Montoya, but Sonoma counted for double points. His win today served as a tiebreaker giving him three wins to Montoya’s two and thus the championship. It’s an outcome likely to rankle a lot of Montoya’s fans. Montoya’s hopes were dashed after coming into contact with teammate Power in lap 39, damaging his front wing and spinning Power out. After pitting in to replace the win Montoya charged from the middle of the pack toward the front, but still had to settle for a sixth place finish. Rahal also complained of technical issues with his car. IndyCar’s season closer was a thriller of a race, especially toward the end. It was also an emotionally tense one following last week’s death of beloved driver Justin Wilson as result of a freak accident in the aftermath of a crash at Pocono. A great race, albeit one that closed a season marred by tragedy. Now that it’s over observers will have to wonder: could this be the last IndyCar season, or one of the last, with open cockpits?